Iyengar Yoga Ku-ring-gai was one of the first yoga schools on the North Shore. It was established by Ruth Willetts, a certified Iyengar Yoga teacher with many years of teaching and practical experience. Beginning with only one class a week in 1982, the number of classes has grown over the years but the school remains relatively small and provides a friendly and nurturing environment. Our teachers are professionals, rigorously trained and assessed in accordance with Iyengar Yoga international standards. Training takes several years and once qualified, teachers must undertake ongoing education to remain accredited. (l-r) Margot Mann (former teacher), Penny Morse, Ruth Willetts and Franziska Thiele. Ruth has been teaching yoga for over 35 years and has been certified to teach Iyengar Yoga since 1982. She has studied with Mr. Iyengar and his family in India and elsewhere on numerous occasions, first in 1987 and most recently in December, 2018. She has been teaching in the Lindfield/Roseville area since 1982. 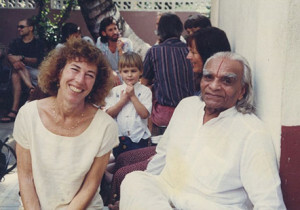 Contributing to the promotion of Iyengar Yoga in Australia, Ruth was President of the BKS Iyengar Yoga Association of Australia (www.iyengaryoga.asn.au) for five years and was instrumental in registering the Association’s Certification Mark and in writing the Association’s present Constitution and Ethical Guidelines. She also trains and assesses Iyengar Yoga teachers. Regardless of age, physical limitations or flexibility, she encourages each individual to work to his or her personal capacity, correcting students verbally or physically when necessary. Though the teaching methods may vary, Ruth believes that it is never too early or too late to begin yoga. Yoga is for all and yoga is for life. Jo has been practicing Iyengar Yoga for over 20 years and has been a qualified teacher for 11. She has been attending classes and teaching at IYSK for the past 5 years and has been to the Institute in Pune 4 times, most recently in 2017. Jo teaches on the Northern Beaches. 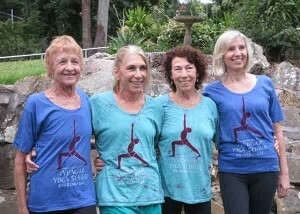 (http://www.yogajo.com.au). Penny Morse has been practising Iyengar Yoga for 25 years, the past 15 with IYSK. During this time, she has consistently attended classes, studied and trained with several senior Iyengar teachers, and taught for 18 years. Penny has visited Pune, India twice to attend Geeta S. Iyengar’s intensive courses and most recently in December 2018 to attend the Centenary Celebrations. Ruth Willetts and Penny Morse in India in December 2015.